These are lyrics by Roxette that we think are kind of nonsensical. 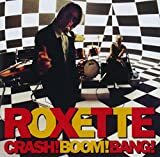 Roxette's, "How Do You Do!" I love your blue eyed voice. Voices don't have eyes or any other colorful parts. Roxette's, "The Centre Of The Heart"
First off, you wouldn't sing that line if you didn't already know that the centre of your heart was a suburb to the brain, and thus you would know what you said when you found out. Second of all, what the **** is that supposed to mean anyway? I think Per Gessle is on drugs (can I say that?) or something. Well... I'm using these lyrics as evidence of my theory that Per Gessle's songwriting approach is "write first, who cares about asking questions".